Chong Wei looking very blur on the pic above :P but he is brave to admit that Lin Dan played a good game and a LOST is a LOST no matter what excuses he gave. Spoken like a true sportmen. 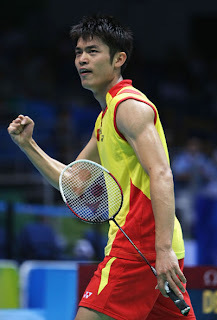 Lin Dan is quite handsome actually. Meanwhile the KLCI is still downtrending with no bottom on sight. Political uncertainty and also the collapse of commodity prices namely palm oil are the major contributor to its downfall. Now it is at 1084..more blood is expected in the coming weeks.